Should You Put Your Money In Jail? I must give credit to my business partner, Peter Lim for this article. Peter and I co-founded a value investing stock investment course called Bursa Method. In the recent online training I hosted featuring him as the main speaker, he shared about the concept of “dead money” and “alive money”. It will be much easier to understand if I just quote some examples right away. When you contribute to EPF (Employee Provident Fund), the money is pretty much “dead” because you just put it in jail. You can’t touch it until age 55. There are some ways to withdraw it such as for housing loan installment (only 30% of the total fund), and also some small portion from account one for direct investment in unit trust or stock market. The other similar type of fund is the recently introduced Private Retirement Scheme and Deferred Annuity. Both funds require your contribution. In return, you also get tax relief and the return provided by those schemes. These are also “dead money” because you can’t touch it until retirement age. There are more examples, such as SSPN (Skim Simpanan Pendidikan Nasional) and even some endowment insurance policies. When you contribute to SSPN, you can only withdraw it when your child reach the age to enter tertiary education. Meanwhile, an endowment policy can be terminated but it will incur a big loss if you do it prematurely. You can opt to withdraw the cash value from endowment plan as a policy loan but that will incur interest charges at normally 7% per annum, calculated on daily-rest basis. Since it literally means that you cannot “touch” the money in these places (EPF, PRS, SSPN, endowment policy), those money is considered “dead money”. Why “dead money” is good? Is “dead” good? I know you must be scratching your head now since I just wrote about the idea of putting your money in jail. In fact, “dead money” can be good for majority of the population. In Malaysia, most retirees get the major portion of their retirement fund from EPF. In other words, most people in Malaysia save more in their EPF and even endowment policies if compared to how much they are saving on their own in stocks, properties or fixed deposit. Most people don’t have the discipline to delay gratification and save money first, then spend only in later years. I was once an active life insurance agent. It is easier to sell endowment policies when we talk about the function of forced savings. When customers see the value of these automated saving system, they feel that it makes perferct sense to purchase these kind of saving plan. They realize that if the money is not put aside for saving and investment, it might be spent elsewhere. Soon the money that is not “put in jail” will be all gone. This is the reason why I said that “dead money” is good. 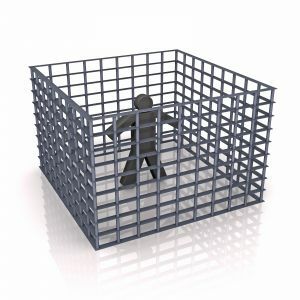 It is okay to lock your money so that it can overcome your disciplinary problem. The big challenge is that these “dead money” is not getting adequate return to make you rich. You might be attracted by the short term benefit in the form of immediate tax relief, and also the long term stable return of 4-7% a year. However, these kind of return is not going to make you a multi-millionaire. To achieve that level of wealth, you will need to do much better than that. It depends very much on how you make use of your “alive money”. Why “alive money” is even better? When we said the money is “alive”, you have full control of it. You have the flexibility to invest it in business, stocks or real estate. You are the decision maker on what to do with this money. It is not locked in any of the places mentioned above so you still have the full flexibility to make good use of it. I’ve shared with you why it is good to locked your money because undeniably, this kind of system work. It will save you quite a big sum of money for your future retirement need. But the only problem is that it is not going to make you rich. You got to have more than 10% a year return to see significant return coupled with the wonder of compounding interest. Actually, it makes a big difference if you can get 15%, 20% or even 25% annual return from your “alive money”. That’s why I said “dead money” is good, but “alive money” is even better. If for the past few years, you are not getting much return from investment, you might not think that this concept is applicable to you. I believe that if you have the discipline to delay gratification and invest consistently, coupled with the appropriate knowledge to get better than average return in properties and stock investment, it is much better to keep your money alive. During the online training session, Peter shared the important four factors you want to consider when it comes to the decision whether you should “lock up” your money. First, it is the duration of the money being locked up. If you are 25 years old now, you would need to lock up your money in EPF for another 30 years. Employees don’t have the choice but to contribute to EPF regularly. The story will be different for those self-employed or those who are working in their own company. You will have the choice whether to contribute less. Obviously, if you have better alternatives to grow your money, it is better to keep the money “alive” rather than being “locked up in jail” for 30 years. The second factor you want to consider is the rate of return you will be getting. It is quite normal to get 4-7% from these schemes mentioned above, on top of the initial year of tax relief. If you can get 15-25% annual return from your stock investment, business or real estate holdings, it makes more sense to put your money at places where it can grow the fastest. The third factor is the current tax rate you are paying. If you are paying 26%, the maximum tax bracket in Malaysia, do a calculation to determine if it is worthy to get the immediate short term gain in the form of tax relief. For example, if you contribute RM1000 this year in a PRS scheme, you save RM260. Then this RM1000 is going to give you say 5% per annum return until age 55. Put these numbers down in a calculation spreadsheet. Compare it with another scenario of using the after tax money, which is RM740 (after paying 26% for the tax from your initial RM1000) to invest in your vehicle of choice, say in a particular stock. If the stock counter provides you 20% per annum, is it going to be better off at the age of retirement? You can easily compare this by making some simple calculation on a spreadsheet. The fourth factor is the discipline issue. Do you have the mental strength to delay your spending? Can you make sure that you are going invest this money for long term? If you doubt yourself, it might be a good idea to lock up this money. So, what do you prefer? 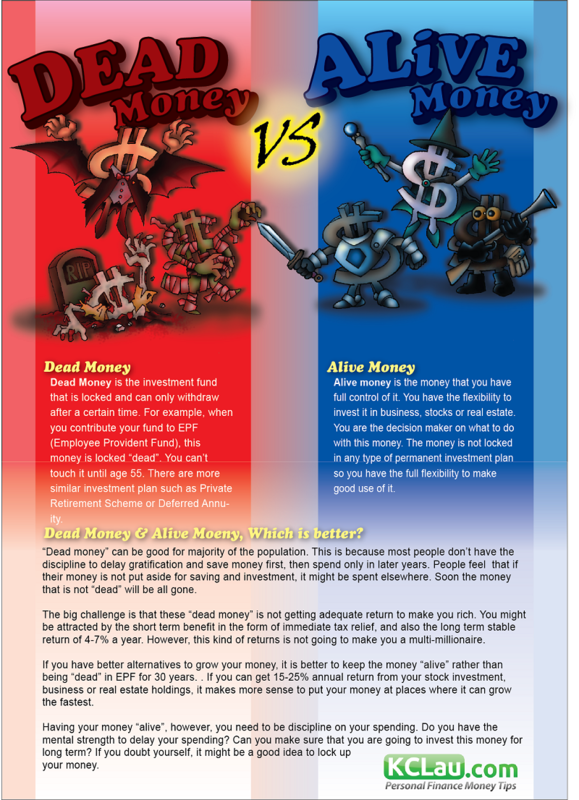 “Dead Money” or “Alive Money”? 13 replies to "Should You Put Your Money In Jail?" Great explanation. But if one can make 15%-25% return on alive money. I’m quite sure he / she would have understand the concept for dead and alive money. They key is how to ensure you get at least 15% return for the next 30 years which everyone is trying to look for an answer. Can you please share which legal company that can guarantee 15 – 25% annual return? I don’t think there is any investment fund can guarantee this kind of 15-25% return. If you manage to find it, those are most likely not sustainable and mostly money game. Appreciate to learn more from you.. This article is just like anyother standard Investment article and I’m sorry to say I do not find it practical. @Dan, nice to see you commenting here. Risk is always there. It is how we mitigate it and take control of our investment, that ensure the magnificent return we want. FYI, you already learnt that reading financial news daily for 5 years won’t give you 12% return. News is just news. You might want to consider reading books on investment, or taking courses on stock investment. There are a lot of successful investors who don’t bother about the news. Hope this is helpful to you. I agree we need both and the decision to go for “alive” depends on individual. Pls remember the main assumption made in going to “alive” path that one is able to make a positive return each yr. not many can achieve 15% a year, and of course the effect of compounding makes it even more exciting. For those who have minimum investing knowledge (not speculating) they r better of going to “dead”at least they r confident to achieve a smaller compounding effect frm epf. The assumption of double digits return couple with compounding effect can sometimes b misleading as not all who go “live” can achieve positive return, and the amount of knowledge required and discipline involve is not for average joe. Js my 3 cents. Well said @Teentitan. The alive path can only work if the person have the knowledge, skill and discipline, which as you said – average Joes don’t have it. Good articles. Can i share it at my website blog for my customer information purpose? @Yen, thanks for being interested. You can republish this article on your website, just remember to post a link back to this orginal article. Great article. Very educational. However, if one can afford to have both “dead” & “alive money”, I believe it would be the best case scenario. We will need to take advantage of both kind of money. I personally have EPF, SSPN etc …for the benefit of tax return. But we shouldn’t rely too much on it to meet our financial goals. Dead money can probably form part of your saving and it is not wise to have all of it there.